For the past 7 months I have been really trying to get in shape by working out at my local gym. While working out I have had many questions about what it would take to start a gym. This week I talk with Kevin Byers who has done just that. 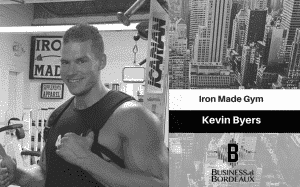 Kevin shared his journey with me about him getting started and growing Iron Made Gym. We cover a lot of business 101, so this is a great episode to learn how to take what you have and make it work. We are having a business book giveaway. All you have to do to win is share your favorite episode of the Business with Bordeaux Podcast with the hashtag #businesswithbordeaux on your social media page. The winner will receive a book from Kelly Cole titled Conversations with Sharks. We will pick a winner on May 1st, 2018.